Meat-Eating Vs. Driving: Another Climate Change Error? Here we go again. On March 22, a scientist at the University of California at Davis pointed out a flaw in "Livestock's Long Shadow," a 2006 report by the United Nation Food and Agriculture Organization (FAO) that attributes 18% of the world's carbon emissions to animal agriculture. It didn't take long for the bashing to begin again. "Eat Less Meat, Reduce Global Warming  or Not" ran a headline on the FoxNews website. "Meat Avoidance Cures Flat Feet and Other Lies," mocked another on a the Cattleman's Blog. London's Telegraph put it succinctly, "Now It's Cowgate." It follows, of course, on what was called "Climategate"  which was precipitated by hackers who broke into the personal email account of a scientist at the University of East Anglia's Climate Research Unit in November 2009 and revealed attempts to play down evidence that did not, on its surface, support global warming. Since then, a small number of errors have been discovered in climate research, including the Fourth Report of the Intergovernmental Panel on Climate Change (IPCC), the organization that won the 2007 Nobel Peace Prize along with former U.S. vice-president Al Gore. Those errors have provided a steady trickle of fodder for climate change deniers and the mainstream media alike. This latest tempest erupted when Frank Mitloehner, air quality expert in UC Davis' Animal Science department, gave a paper at a conference of the American Chemical Society. In that talk he noted that a much-cited comparison in the FAO report  that livestock produce more carbon emissions worldwide, at 18%, than transportation, at 15%  was based on a faulty comparison. To calculate the impact of animal agriculture, the FAO reports' authors relied on a method called life cycle assessment, which charts the emissions of every aspect of raising meat, beginning with the carbon costs of clearing land for planting the grain the animals eat, and following it all the way through until a package of beef is sitting in the supermarket. The figure for transportation-related emissions they used only counted those produced when vehicles burn fossil fuels, not the full production cycle of petroleum. "They did life cycle assessment for one and not the other," Mitloehner says. "They basically compared apples and oranges." Pierre Gerber, livestock officer at the FAO and one of the 2006 report's authors, admits that the comparison was flawed. "It's a weakness that we were aware of the issue when we used it," he says. "But it's not the point of the report. We included the comparison only because we wanted to give the reader a frame of reference." Gerber says the FAO is currently engaged in a follow-up project designed to provide more details on where those emissions originate. "We're working on a more sophisticated analysis that will break down emissions by commodity [type of animal], by farming system, and by region," he says. Environmentalists and some climate scientists (to say nothing of vegetarians) have used the FAO's work to call for a reduction  or even eradication  of meat eating. That idea, Mitloehner said in the same talk, is misguided. "Smarter animal farming, not less farming, will equal less heat." He elaborated on the point in a separate interview. 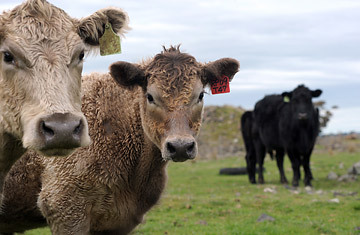 "Globally, producing less meat is only going to mean more hunger. Feedlots are very efficient at converting animals into food. That's something to keep in mind if our goal is to feed as many people as possible with as few resources as possible." Already, Mitloehner's finding is leading many to suggest that reducing meat consumption or using more sustainable livestock management systems won't help mitigate climate change. But for the FAO's Gerber, that's just not the case. "You have to find a balance depending on local circumstances," he says. "Maybe in Africa I need to improve meat and dairy production. But that in affluent countries, in places where each person on average annually eats 80-120 kilos of meat, a lot can be done to reduce emissions at the consumption level." Gerber regrets that the FAO's error in comparative methods is being used to suggest once again that the science of climate change is fatally flawed. But he's not too worried that the mistake will have a lasting impact. "If someone wants to use it as a way to close their eyes to the problem [of global warming], fine," he says. "It won't serve them for very long." Mitloehner has received $5 million in funding since 2005, of which 5%  $250,000  is from the dairy and beef industry. The rest is from government agencies. Stanford University climate scientist Stephen Schneider, a contributor to IPCC, says, "His point about incomparable assessment methods is good science. But the second point [about smarter farming vs. less farming] is a value judgment." Any possible distinction between the two is likely to be lost in the increasingly inflamed rhetoric surrounding climate change. In the wake of the CRU revelations, a handful of errors have been discovered in the leading scientific literature on the subject. The IPCC report, for example, claimed that Himalayan glaciers could disappear by 2035 if the world continued warming at its current rate  a finding that is not only false, but turned out to be based solely on a speculative comment that one researcher made to a reporter. In February, the authors of a study published in Nature Geoscience that predicted that sea level would rise by between 7cm and 82cm by the end of the century, were forced to retract their article, citing two mistakes in their technical calculations. The discoveries have given new fuel to those who doubt or deny that the earth is warming and that human activity is responsible for it. In December, Republican senator James Inhofe called for an investigation into whether "the 'so-called consensus of global warming'... was contrived in the biased minds of the world's leading climate scientists." A Gallup poll, released earlier this month, found that 48% of Americans think the threat of global warming is exaggerated, an increase of 13% since 2008. And only 52% believe that most scientists accept the reality of global warming, down from 65%. However, for the vast majority of the scientific community, the errors that have emerged do nothing to undermine the overall consensus that climate change presents a real and pressing risk to the globe. "They have found perhaps three mistakes in the IPCC report out of, what, 1000 conclusions?" says Schneider. "That's an incredible batting average. Think about it in comparison to predictions about health care or the economy  it's better than any other human forecasting endeavor." The original version of this story said that a study by Frank Mitloehner that concluded that normal cow belching was responsible for the majority of cattle methane emissions was contrary to that of Environmental Protection Agency research. The EPA does attribute the majority of livestock-related emissions to enteric fermentation (belching and farting). At the request of the Univeristy of California Davis, TIME has indicated the amount of funding that Frank Mitloehner has received from the dairy and beef industry since 2005.